If there's anything you would like to learn about cost per lead, you'll find your answer here. 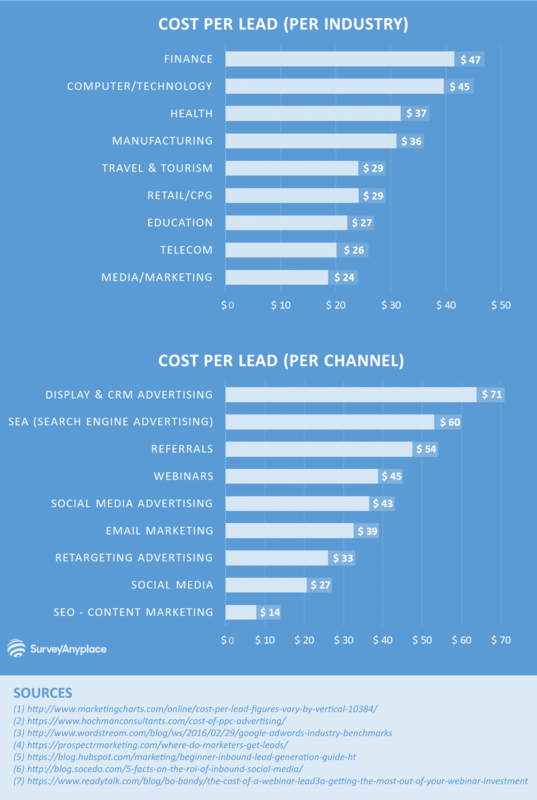 After some extensive data research, I came up with a two cost per lead graphs, one with an average cost per lead by industry and one by online channel. Allowing you to get the latest numbers and insights on online cost per lead and lead generation. If that wasn't enough, I've included a list of 22 influential articles on the subject. To avoid puzzled looks throughout this post, I'd like to define a lead as someone who leaves any kind of contact information behind. This could be an email address, phone number or just a name. Knowing your cost per lead allows you to evaluate new strategies. Does the new medium or strategy create leads at a lower cost per lead than previous channels? If so, it would be worth implementing. So how do you do it? It's actually a very straightforward formula. Simply divide what you spend on a campaign or channel by the number of leads that came in from that channel. For example: consider your company spent $3,000 on a pay-per-click (PPC) campaign and 50 users converted to leads: Cost per lead = $3,000/50 = $60 per lead. The cost per lead will be different depending on your industry, channel or the quality of a lead. If you want quality, a higher cost per lead might mean a higher quality lead, and a lower overall customer acquisition cost. If you want quantity, you might want to lower cost per lead, even if the leads aren’t as qualified. The first chart focuses on the online CPL between different industries. Finance and technology have the highest cost per lead with respectively ($47 and $45), whereas telecom and media/marketing have the lowest with a CPL almost half of that. ($26 and $24). A lower CPL can have multiple reasons. The industry could be less competitive, and less competition leads to lower cost per clicks and eventually a lower cost per lead. Or the value of a lead could be lower. After all, if it costs you more to acquire a lead than he is worth, your business isn’t sustainable. When looking at the CPL per online channel you notice the high cost for display and CRM advertising at $71 per lead. Not a big surprise, since display advertising is used for retargeting and a way to keep leads warm rather than as a lead generator. The channel with the second most expensive cost per lead is search engine advertising (SEA). This bigger brother of display advertising is a bit more effective, yet still expensive. Google can be partially blamed for the constant growth in cost per click, together with the increasing number of competitors. There are however big differences between the industries for SEA. At the bottom of the chart we see that Search Engine Optimization (SEO) and content marketing have the cheapest cost per lead at $14. Especially if this is done well and in-house, SEO can be a cheap lead generator. However, with the ever-growing amount of content being produced every day, the lead generating powers of SEO might diminish. I limited the graph to only online sources with good reason. Firstly, as mentioned at the start, digital marketing is booming business and secondly, offline CPLs range from $300 up to $500. Combining two sets of different data would give back an average cost per lead too high for online and too low for offline channels. And that wouldn’t benefit anybody. When I was looking for useful cost per lead data, I stumbled upon dozens of articles on CPL and lead generation. While some of those lacked the insights and quantitative data you need for your analysis, I also came across a few gems that I definitely didn’t want to keep from you. The success of social media advertising has been immense. And it shows! From 2014 to 2016, social advertising budgets have doubled worldwide over the past 2 years—going from $16 billion U.S. in 2014 to $31 billion in 2016. But despite this growing investment in social advertising, 46 percent of B2B marketers say they’re unsure whether their channels have generated any revenue. The cost for online marketing has increased a lot the last decade. Not a big surprise, with higher keyword competition and more competitors joining the party year after year. The average cost per lead of $33 (for 2016) is a good indication. If the trend from the last decade ($7,5 CPL just 10 years ago) continues, chances are that the cost will keep growing. In the Software/SaaS industry, AdWords drives, on average, 16% of all leads, 14% of all opportunities, and 11% of all revenue. The declining impact as we get further down the funnel shows that companies in this industry still tend to use AdWords as a top-of-the-funnel lead gen channel. According to the data, Software/SaaS companies spend on average $344 to generate a lead. By tracking the right KPIs for your business, you’ll be able to measure the most meaningful analytics and make more educated marketing decisions. While these KPIs are useful in tracking progress and proving the effectiveness of your digital campaigns, they are useless if you don’t use them to make educated decisions about your goals, strategies and tactics. You must learn which factors will influence each of these metrics so that you can continue to optimize and improve your site. Both of these strategies have been proven to increase sales, so which works out as better value for money? And why did I focus on cost per lead? Perhaps the most important difference is that with cost per click models, you are often paying for accidental clicks or people who were just curious and not looking for your business. With customer generation you only pay for genuine business leads that match your predefined criteria. So you are more likely to secure a sale through cost per lead. This article gives you an overview of the cost per lead for each industry within the PPC space. Overall, they find an average CPA (cost per acquisition) in AdWords across all industries is $59.18 for search and $60.76 for display. (Almost) free love on the SERP! Dating and personal sites have, by far, the lowest average cost per action from search ($6.91 CPA). While Google may be a great place to find a boyfriend, it is an expensive place to find an employee, doctor, or lawyer – average search CPAs for employment services, medical services, and legal services are $105.79, $126.29, and $135.17, respectively. Of course, the lifetime value of a new client in these industries is very high, making it all worthwhile in the end. B2B marketers say email, organic search, whitepapers, webinars, and LinkedIn are the most effective digital channels for generating leads. Email ranks as the top channel for driving leads (73% of respondents say it does so), followed by organic search (70%). Making SEO both on- and off-page very important for B2B marketers. Healthcare and insurance have among the highest cost per lead, so when you’re in health insurance, the combination of those two, you’re bound to have a high CPL. And indeed, health insurance is among the most expensive industries to advertise in. The most interesting part of this article is the section about the top 20 health insurance keywords by spend, where we see that they average a CPC of $4.86, up to a maximum of $13.07 per click. PER CLICK! Given that the conversion rate for these keywords is going to be low, people only have one health insurance. What they pay per lead will be well above $100 per lead. Buyers might be anywhere from two-thirds to 90% of the way through their buying journey before they even reach the vendor. The main reason? Buyers have so much access to information that they can delay talking to sales until they are experts themselves. Creating a solid lead generation strategy will help you build trust. And it will capture the interest of your buyer before they are even ready to contact sales. Webinars are on the rise: about 62% of all B2B marketers are now using them as part of their promotional strategy. Still, the cost of producing a single webinar can be rather expensive. But is it really so much about the total cost of the webinar, or is it more about the total cost of a lead? This article does the math. 54% of marketers say referral marketing has a lower cost per lead according to the research. Referral marketing is one of the lowest cost per lead growth channels available to you today. When respected websites or blogs talk about you, this will immediately raise your credibility. It’s also perfect for reaching new target audiences. It’s all about finding the right influencers for your industry. 97% of Google’s income comes from pay-per-click advertising, that’s about 32,2 out of 33,3 billion dollars. Which made the people over at Wordstream wonder which keywords would be the highest grossing ones. This article lists the 20 most expensive keywords, with some of them going as high as $50 per click. Social media can be used for inbound marketing as well as outbound marketing. Which means you can provide great content and wait for people to reach you. Or you can approach them with all sorts of social media ads. Either way, it tends to be very effective. The ROI, however, can look pretty different for both strategies. These are the main findings: Social media has a click-through rate of about 30%. Making businesses that have a landing page built to capture leads have a cost per lead in the $20’s or lower. On average, inbound channels, including social media, SEO, and content, have a CPL around $27. There are stunning discrepancies between how well some sources are used for certain industries. For example, did you know that B2B companies are getting 14% of their leads from SEO but only allocating 12% of their budget to that source? Or that the three worst lead sources for B2B companies are traditional advertising (3%), PPC (6%), and direct mail (6%). This infographic shows us that healthcare has the highest B2B CPL with $60, followed by Business Finance ($43), Human Resources ($38), Marketing ($32) and Technology ($31). And spending will continue to grow since 50% of B2B marketers indicated that their lead gen budgets will increase. Marketers found trade shows, referral marketing, and in-house email marketing to be the best channels for generating large numbers of high-quality leads. When it came to content, videos were not only the most-used type of content (used by 92 percent); they were most commonly cited as producing a very high volume of leads. Learn how to calculate the cost per lead step by step and why it's so important to know yours. The best part about this article is the way it goes beyond the numbers. 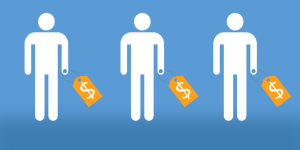 What does it mean to have a high or low cost per lead? What's the link between Cost per lead (CPL) and Customer Acquisition Cost (CAC) and what it says about your marketing strategy? The most important lead generation goals are improving the quality of leads (77%), followed by acquiring new customers (50%) and increasing the number of leads (41%). If you combine these insights with the bright orange thread article you can expect cost per lead will continue to go up. Content marketing costs 62% less than traditional marketing and generates about 3 times as many leads. Sharing content on relevant third party sites can help gain recognition as ‘thought leaders’ in the industry. This article gives you a clear overview of how online lead generation works. And more importantly: how to set up your online lead generation funnel and turn it into a selling machine. We've been talking a lot about lead generation. So as a send-off, let's indulge in the next step. Because lead generation is only the start. Once a lead is generated, it's time to qualify it. This thorough article explains how lead qualification should be done to maximize your sales. So there you have 'em, the most influential articles on cost per lead and lead generation. Apart from the one you just read, of course! Did I miss anything? Or do you want to share your insights? Feel free to leave your comments below. Nigel Lindemann is a digital marketer at Survey Anyplace.